Student Artwork - Square One - Available now! Student artwork is available now through this special Square One bi-annual Center School fundraiser. You won't want to miss this! 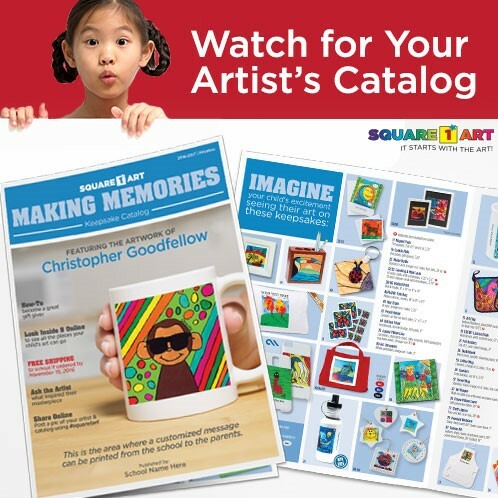 Center families can order their child's artwork onto products (mugs, tiles, bags, aprons, etc.). This is a perfect gift opportunity for Mother’s Day (April), grandparents, holidays, or loved ones. Proceeds support important Center School programs and supplies. These custom gifts are classics cherished by many Center school families. Check out the display case (near front office) with examples of student artwork and Square One products. Students worked hard on this project, thanks to the support of art teachers Mrs. Goldman and Mrs. Salz. Orders returned to teacher, front office, or online.